You can’t grow that organically! It is always a bit of a shock when someone asks me if something — apples, pigs, turkeys, you-name-it — can be grown organically. I’ve heard the questions so many times over the years that it really should not be a surprise to me, but optimist that I am, I always think that I will never hear the question again. Why? Because every type of food can be grown organically. Prior to World War II, everything was grown organically. Every 19th century farmer was an organic farmer. If something could not be grown organically, it became extinct. Today, there are some genetically-modifed organisms that cannot be grown organically, but that is because they were created so that they would require the additional inputs that can only be purchased from the seed developer. It is a great idea for growing a crop science company. It is a terrible idea for sustainable agriculture because it is quite simply unsustainable. Buying seeds and soil amendments year after year is the opposite of sustainable. However, if you are reading this blog, I’m assuming it is because you are looking for more sustainable ways of living. And that means you plant open-pollinated, heirloom vegetables. You raise hardy, heritage breeds of livestock. The animals are on pasture, so that they can live as nature intended, and you are not scrambling to fix problems created by confinement. I have never had a sick pig, and I can count on one hand the number of chickens and turkeys whose lives did not end as someone’s dinner (either ours or a coyote’s). Anyone who claims they have to feed antibiotics to animals in their daily rations has a management problem — and if they fixed the management problem, the animals would be healthy. 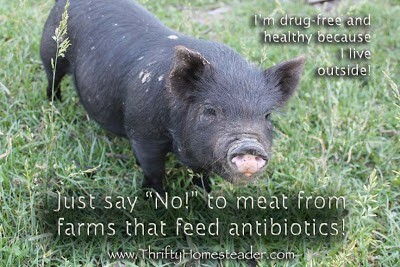 Ultimately, the humans eating the animals would also be healthier, and we wouldn’t have the problem that we have with antibiotic-resistant diseases. If Big Ag wants to claim that raising food organically isn’t profitable enough for them, I can’t argue. Although I do know plenty of organic farmers who make a good living, they don’t live in million-dollar mansions like Big Ag executives. But if anyone tells me that it is impossible to raise food organically … well, they’re just plain wrong. I don’t know if this will work in Alaska, but some people in very cold climates have their goats in a greenhouse so that they are getting sun, and it’s much warmer in there during the day when the sun is beating down on it. I know it wouldn’t be much help in the very short days in the dead of winter, but it might be nice now when the days are getting longer.